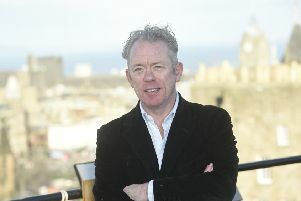 Fred McAulay revealed the line-up for That's Fife comedy festival. SCOTTISH stand up comedy legend Fred MacAulay and Rosyth’s physicist turned state-of-the-art comedy magician, Kevin McMahon unveiled a programme of comedy for That’s Fife. Sitting astride two painted hippos sculptures, the pair announced the line-up which will take place across the Kingdom from 1 to 30 April 2016 with Rothes Hall, Glenrothes, the central hub of the festival. Included in the festival will be comedy masters of the stage, TV and radio to anarchic cookery and magic, classic comedy film screening and a homage to Morecambe and Wise. After only two years That’s Fife has firmly established itself on the UK’s comedy calendar enticing the comedy big guns north of the Forth. Established masters of their craft including Ireland’s Ardal O’Hanlon and Ed Byrne, the master ventriloquist Nina Conti, acclaimed Geordie comic Chris Ramsey and the Edinburgh based Canadian émigré Tom Stade will be taking to the stage. They join stars of Scottish comedy and theatre, Dorothy Paul and Fred MacAulay, together with the hottest up-and-coming talents of alternative comedy Kevin McMahon, the Fife comedian who masterfully combines physics and magic, and George Egg, who has perfected the art of comedy gastronomy. For the 2016 That’s Fife Comedy Festival Fife Cultural Trust have joined forces with the Gilded Balloon, who have been programming comedy at the Edinburgh Festival Fringe for more than 30 years, to deliver the most expansive and inclusive programme yet; with events across Fife’s main cultural hubs. Rothes Halls, at the heart of Fife in Glenrothes, Carnegie Hall, Dunfermline, Adam Smith Theatre, Kirkcaldy and The Byre Theatre, St Andrews will all be serving up top quality comedy. Evan Henderson Fife Cultural Trust’s ‘That’s Fife’ Comedy Festival’s Director said: “It’s really exciting to launch this brilliant festival line up with Karen Koren from the Gilded Balloon today at Rothes Halls - otherwise to be known as Comedy Central from this April. That’s Fife Comedy Festival Information can be found here.